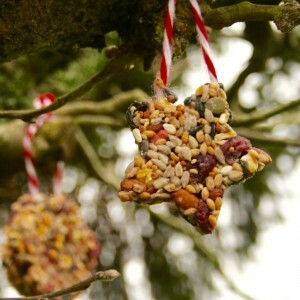 Haskins Garden Centres has released some top tips on how to create decorative homemade bird cakes. Birds forage for food in the winter as they need high fat foods to provide energy and survive the colder nights. Alasdair Urquhart, plant advisor at Haskins Garden Centre, Ferndown, said: “Looking after your feathered friends this winter can be a fun and rewarding activity for children. Help them out by creating high energy treats. Mix the dry ingredients together in a bowl, using a ratio of one part fat to two parts dry mixture. Gently melt some lard or suet in a saucepan and add to the dry mix. Stir well to ensure all the fat is absorbed and the mixture sticks together. Place a sheet of grease-proof paper onto a tray and lay out the cookie cutters and cake shapes. Spoon a half layer of the warm fat mixture into the moulds and place a long loop of string on top. Then fill the remaining mould to sandwich the string. Push the shapes from the moulds. Hang the cakes in a tree or shrub and wait for the birds to arrive. Gardman Wild Bird Care has partnered with The Royal British Legion to help raise £200,000 for serving members and veterans of the UK Armed Forces and their families with the launch of an official Poppy Bird Feeder and charity Wild Bird Seed Blend… What Gardman say: Over the past year Gardman have been working with The Royal British Legion to create a stunning cast iron Poppy Bird Feeder. Through sales alone we have set ourselves the challenge of raising £200,000 for The Royal British Legion by Remembrance Sunday 2016. 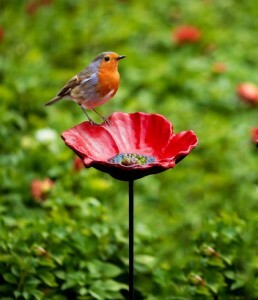 So help them and buy a gardman poppy to feed the birds in your garden today!